President Lincoln had the Confederate delegation delayed at City Point and wired Gen. Grant that he was not to alter any plans he had for prosecuting the war, no matter what he heard about peace talks. President Lincoln then ordered the delegation sent to Fort Monroe at Hampton Roads, where on February 3rd, Lincoln and Secretary of State William Seward met with the Confederate delegates on board the steamer River Queen. When asked if there was any way to put an end to the war, Lincoln’s reply was short and crystal clear. “There is but one way. Those who are resisting the laws of the Union must cease their resistance.” This was simply a reworded repetition of what Lincoln had already communicated to Jefferson Davis directly, that the war would end only when the South ceased hostilities and submitted to the laws of “our one common country.” The peace conference ended with both sides as far apart as ever. Meanwhile, Grant had heeded President Lincoln’s advice. Early on Sunday morning, February 5th, a force of about 35,000 men, consisting of Gen. Warren’s Fifth Corps, the second and third divisions of Gen. Humphreys’ Second Corps, Gen. Gregg’s cavalry division, and artillery, left their camps in another attempt to disrupt the western supply route. The men of the Second Corps slogged westward along the north side of Hatcher’s Run and established a defensive line just east of Burgess Mill where they had fought in October. (See posts of 10/24/2014 and 10/31/2014.) At the same time the Fifth Corps advanced westward south of Hatcher’s Run. Our line had been formed and rifle pits (breastworks) thrown up and the picks and shovels carried away by the Pioneer Corps when it was discovered by the fire of the advancing enemy that a mistake had been made and the line was at exactly right angles to the proper direction. The change in the line was quickly made and a new line of works erected under fire by the men without tools and the celerity with which this was accomplished showed what could be done under a certain amount and kind of pressure. We occupied this line for several days and one night here I had the experience of being frozen in bed. It rained and freezing as it fell, our blankets were firmly frozen to the earth and we under them in the morning. During the change of position described above, one man was killed, Lt. Franklin Bartlett (Co. F), the youngest officer in the regiment. Several others were wounded. South of Hatcher’s Run, parts of the Fifth Corps fought a back and forth battle around Dabney’s Mill on February 6th, during which Confederate Brig. Gen. John Pegram was killed. 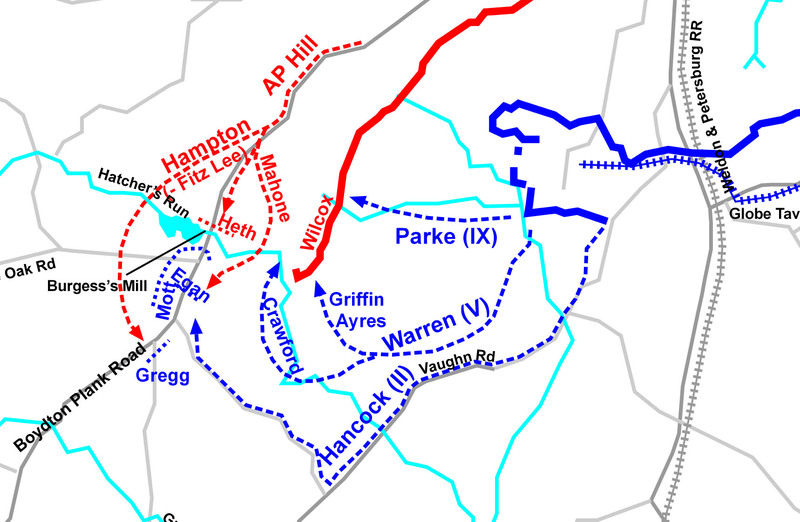 The Battle of Hatcher’s Run was considered a Union victory. True, a smaller Confederate force had once again stopped the advance of a Federal force twice their size and the vital western supply route remained unmolested. But the ground taken and held by the Second Corps allowed the Federal line of entrenchments to stretch to Armstrong’s Mill, three miles closer to the South Side Railroad that continued to shuttle Confederate supplies and men into Petersburg. This entry was posted in 1865, Battles of the 14th, Siege of Petersburg on February 6, 2015 by admin. Last week we left our friends in the Fourteenth Connecticut after they, with lots of help from Federal artillery and other portions of Hancock’s Second Corps, had seized control of the vital Confederate supply route southwest of Petersburg, the Boydton Plank Road. In the vicinity of Burgess Mill on Hatcher’s Run, Confederate Gen. Henry Heth organized a strong counterattack of infantry and cavalry and sent them forward to attack the Second Corps from three sides simultaneously. The Wikipedia map below shows the scope of the battle during the afternoon of October 27th. The Fourteenth Connecticut was part of the Second Division, now commanded by Brig. Gen. Thomas Egan, because Maj. Gen. John Gibbon had been given a corps command. Just then (about 1:00 p.m.) a heavy rain storm came up and drenched us to the skin, compelling us to lay still until it was over. After the storm was over the artillery upon both sides opened fire and the battle commenced again. The rebels were not idle. but hard at work upon our right flank where they drove in our cavalry and were making for our battery, which their guns were trying to silence. We were moved at double-quick for a little way when we saw the Johnnies forming behind a house and barn pretty close to our battery. We charged them and drove them down the road to a mill near a bridge where we captured a few of them, the remainder of them crossing the bridge and going up a hill into some woods. They came near fetching me upon their last charge, a rifle ball cut the strap of my knapsack clean off my shoulder and went through my rubber blanket. The knapsack, lurching over to one side. nearly threw me down. Some of the boys reached for me and the colors, but I was all right, and if they don’t get nearer than that I shall remain so. We next took possession of one of their rifle-pits on the brow of a hill opposite to the Rebels, but with the creek (Hatcher’s Run) between us. If we could have brought a few more men into action when we first came up, we might have captured that rebel battery, but we had to stop before reaching it as we were exposed to a flank attack and we had to fight upon both flanks as well as at the front while the rest of the corps was coming up. The rebels wanted the plank road real bad and during the day charged it three times, but were each time repulsed by portions of our Second and Third Divisions. If the Johnnies could have got the road our whole brigade would have been captured, for there was no getting out with the enemy fighting us on every side. After dark we began to get out, a few men at a time, silently falling back over the hill, where we were reformed preparatory to moving back to camp. We left behind us one man from each company on picket and also Dr. Dudley with our killed and wounded who were unable to walk. I think the rebels had us in a pretty tight place and a part of the Fifth and Ninth Corps had to come out and open a road in our rear. The roads were ankle deep in mud. but we kept up our return march until two o’clock in the morning when we rested until daylight, when the Fifth Corps left us and our brigade was put on duty as rear guard. We finally got back into our lines all right and last night we got into our old camp, where I am now writing. Casualties to the regiment during this battle were: 1 officer and 3 enlisted men killed, 1 officer and 11 enlisted men wounded, and 14 enlisted men captured by the enemy. This entry was posted in 1864 - Autumn, Battles of the 14th, Men of the 14th, Siege of Petersburg on October 31, 2014 by admin. The idea for Federal forces to go on the offensive one more time before winter descended upon the siege lines around Petersburg originated with Maj. Gen, George Meade. On the evening of October 23, 1864, he discussed his plan with Lt. Gen. U. S. Grant. It was similar in design to the strategy of attacking both flanks simultaneously that had been used with mixed results throughout the summer and early fall, but the force employed would be larger, and the attack on the western front would cover a wider section of the Confederate line. Intelligence Meade had gathered from Confederate prisoners indicated that the entrenchments west of the Union line at Fort Cummings were poorly constructed and there were but few defenders. The map above was drawn in 1865. Fort Cummings is marked in bright red and in October 1864, no Federal fortifications had been built to the south and west. Fort Cummings was the end of the line. Meade’s strategy was simple. While Maj. Gen. Benjamin Butler demonstrated against the Confederate lines east of Richmond with the Army of the James, the Army of the Potomac would assault the weak Confederate lines southwest of Petersburg with three corps of infantry—about 35,000 men. The three corps were the Second under Maj. Gen Winfield S. Hancock, the Fifth under Maj. Gen. G. K. Warren, and the Ninth under Maj. Gen. John Parke. The Fifth and Ninth were to drive hard against the Rebel works and be ready to instantly exploit the breakthrough that was sure to come. 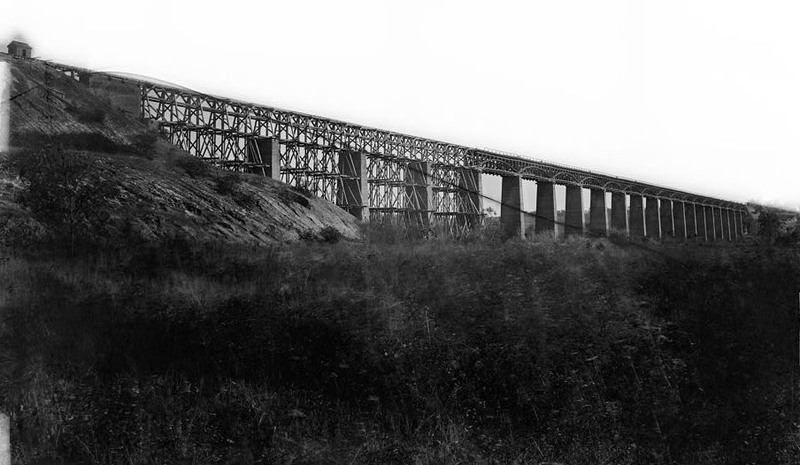 It was the Second Corps’ job to march hard for the Boydton Plank Road and, once it was securely in Federal hands, strike northward toward the South Side Railroad. To the left (south) of the Second Corps, Gen. Gregg’s division of cavalry guarded the flank. At about 3:30 a.m. on Thursday, October 27, the three columns of infantry moved out. Things went poorly from the start. 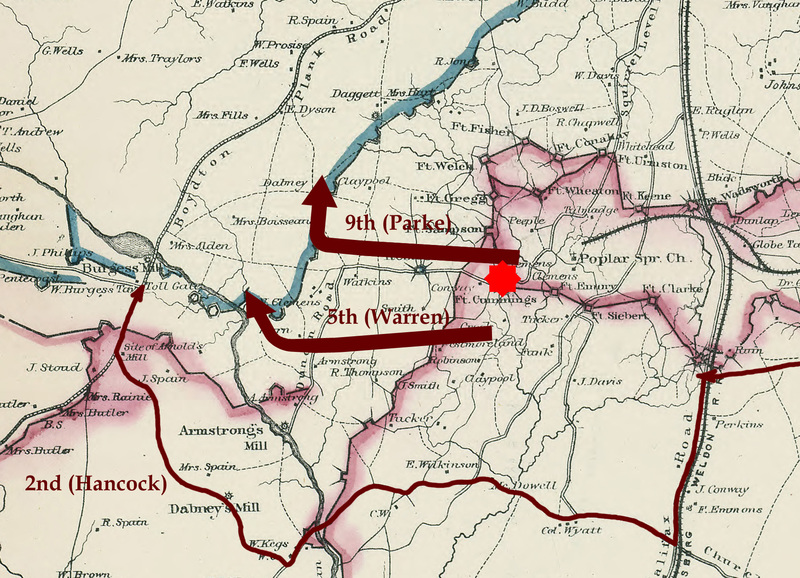 Parke’s Corps moved slowly westward. Light rain and mist made the way slippery with mud. Officers didn’t know the roads and sporadic Confederate sharpshooting hindered their progress. When they finally did come upon the main Confederate line, it proved to be much stouter and more heavily manned than they had been told. No further progress was made and with the day but half spent, Parke’s men dug in. Warren’s Corps fared little better. They lost their bearings in the dark and when they finally did get headed in the right direction, they ran into Confederate resistance north of Armstrong’s Mill. Pushing on a little farther, Warren’s men also discovered that Federal intelligence was wrong. A strongly enemy line of entrenchments lay across their line of advance. Warren, who was an engineer before the war, stopped and analyzed the situation. Another of Gen. Lee’s vital supply routes was now in Federal hands, but Confederate forces were rushing to face this new threat. The Second Corps was once again dangling unsupported at the end of the line, just as it had when the Confederates had almost destroyed the corps at Ream’s Station. Hancock had been personally humiliated then and his confidence in his men was shaken. Next week, we’ll see if the once superb Hancock had one more great fight left in him. This entry was posted in 1864 - Autumn, Battles of the 14th, Siege of Petersburg on October 24, 2014 by admin.